China’s attempts to suppress information about Xinjiang open floodgates to scrutiny of its indoctrination policy. Sauytbay shows her joy and happiness after the verdict. Photo courtesy of the author. All rights reserved.The trial of a woman who had worked in an indoctrination camp in China’s western region of Xinjiang has put the fate of minority Muslims under the spotlight of international media. Beijing’s attempts to suppress the flow of information about its over-policed Xinjiang province – where security forces are locking up, among others, ethnic Kazakhs visiting or returning to China from Kazakhstan – appears to have backfired after a Kazakh court ruled against the deportation of Sayragul Sauytbay to China in early August. Sauytbay was tried in the languid Kazakh town of Zharkent, near the border with China. On 1 August, the judge ordered her release, delivering a suspended six-month sentence instead for illegally crossing the border. The sentence dismissed the previously-feared possibility of her deportation back to China. 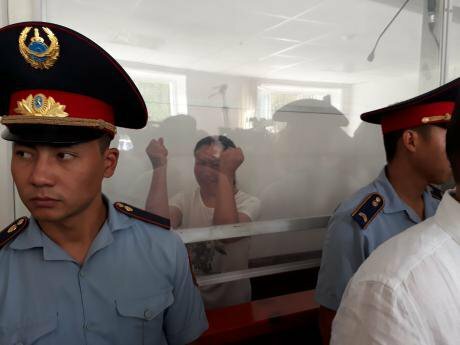 The woman, who was tried at Beijing’s request, made a plea during the trial not to be handed over to China, claiming she could face the death penalty for revealing the existence of political “re-education camps” for ethnic Kazakhs in the country. As part of her defence, Sauytbay claimed to have worked for four months in a camp before fleeing to Kazakhstan. Emboldened by Sauytbay’s revelations, many of her fellow ethnic Kazakhs who moved from China to Kazakhstan have now come out with stories of relatives who they fear may have ended up in such camps. Some of those who managed to escape from the camps have also recounted their stories. The trial indirectly forced the Chinese authorities to admit to their actions in Xinjiang against ethnic Kazakhs, though they claimed that these measures were in place for all citizens and that, ultimately, this was a Chinese internal matter. Meanwhile, Sauytbay’s lawyer has warned that Beijing may still try to seek her extradition, hinting that Sauytbay’s problems may have just begun. In her emotional and passionate closing statement, Sauytbay argued that she could only cross the border illegally because the Chinese authorities had seized her documents in 2016, when she had tried to move to Kazakhstan with her family. At the time, the authorities explained that since Sauytbay was a member of the Communist Party and headed a state-run nursery, she needed to undergo additional checks. “I crossed into Kazakhstan illegally because it was the only way for me to escape life in the camp,” Sauytbay explained. Her previous attempts to get her passport back to visit her husband and two underage children, who acquired Kazakh citizenship in 2017, had failed. Ultimately, she managed to acquire a permit to visit a free-trade zone on the Kazakh-Chinese border and used the opportunity to sneak into Kazakhstan. “If my documents had not been seized by the Chinese authorities, I would have come here legally with my family. I would have been living a peaceful life and I would not have had to carry out any illegal action,” she explained. Sauytbay pleaded guilty of crossing the border illegally but appealed to the prosecution and judge not to deport her to China where, she said, she would face the death penalty for revealing during the trial that she had worked in a re-education camp for ethnic Kazakhs between November 2017 and February 2018. “After they appointed me to work in a political camp – which is a secret body – they engaged me in collecting secrets and forced me to sign a pledge not to reveal state secrets abroad. That measure had a clear purpose: even if only part of it is disclosed, then you will be sentenced to death,” Sauytbay said in court. Beijing denies the very existence of indoctrination camps for Muslim minorities, mainly Uighurs, ethnic Kazakhs and ethnic Kyrgyz. Sauytbay told the court that around 2,500 ethnic Kazakhs were held at the camp where she worked and that she had heard about two other similar camps. During the trial, Zhang Wei, China’s consul general in Almaty, repeatedly gave interviews to local media urging ordinary Kazakhs not to believe the “falsified and groundless accusations” brought against China regarding ethnic Kazakhs in Xinjiang. However, research by Adrian Zenz of the European School of Culture and Theology in Korntal, Germany, suggests that “at least several hundred thousand and possibly just over one million” people had been interned in indoctrination camps in Xinjiang. The province’s population was 24 million people in 2016, with Uighurs accounting for 46% and ethnic Kazakhs for 7%. “Satellite imageries suggest China is expanding detention camps in Xinjiang at an unprecedented pace. The time of detention camp booming coincides with the escalation of China’s war against ‘terrorism, separatism, extremism’, which is reported to be targeting Uyghur and Kazakh minorities,” Shawn Zhang, a law student at the University of British Columbia in Vancouver, argued in a study of satellite imageries of suspected new prisons in Xinjiang. “It’s unclear whether these detention camps serve as ‘re-education camps’,” he added, providing satellite images of facilities he suspects serve as prisons. 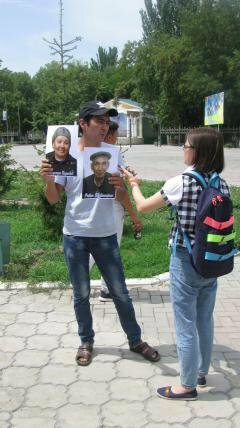 Nurbolat Tursynzhanuly, an ethnic Kazakh from China who obtained Kazakh citizenship in 2016, holds a protest during Sauytbay's trial to draw attention to the detention of his parents who are Kazakh citizens in China. Photo courtesy of the author. All rights reserved.On 13 August, at a meeting held in Geneva by the UN Committee on the Elimination of Racial Discrimination, the Chinese delegation rebuffed the one-million figure as “completely untrue”, but indirectly admitted to the existence of a state policy to resettle and re-educate Muslim minorities in Xinjiang. Ethnic Kazakhs started raising the alarm about the fate of their relatives in China in 2017. The situation in Xinjiang has deteriorated for Muslim minorities after Chen Quanguo, an official notorious for his rigid ethnic policy towards Tibet, became the head of the Communist Party’s regional branch in Xinjiang in August 2016. After Quanguo’s appointment, ethnic Kazakh migration from China to Kazakhstan surged from 628 people in 2015 to 2,103 in 2016 and 3,184 in 2017. After obtaining independence in 1991, Kazakhstan has been running a programme to help ethnic Kazakhs abroad (oralmandar) to move to Kazakhstan. Under the programme, around one million people migrated to Kazakhstan between 1991 and 2016, of which 14.2% from China. Many ethnic Kazakhs from China now live in Kazakhstan with residence permits (yqtiyar khat in Kazakh) which allow them to enter Kazakhstan visa-free and stay in Kazakhstan for 10 years so they can make an informed decision about their move to Kazakhstan. Following the release of Sauytbay, Kazakh Foreign Minister Kayrat Abdrakhmanov admitted that ethnic Kazakhs were facing problems in China, adding that Kazakh diplomats were working with their Chinese counterparts to lift a travel ban on 625 ethnic Kazakhs who had applied to move to Kazakhstan. In an unprecedented turn of events, the prosecutor in Sauytbay’s case rejected the defence’s attempts to enter a plea bargain during the trial. Instead, the prosecutor requested the judge to look into the mitigating circumstances that led Sauytbay to cross the border illegally, before asking for a lighter sentence, without calling for her deportation to China. “The Chinese citizen Sayragul Sauytbay committed a crime in order to reunite with her husband, Kazakh citizen Uali (Slam),” the prosecutor said. 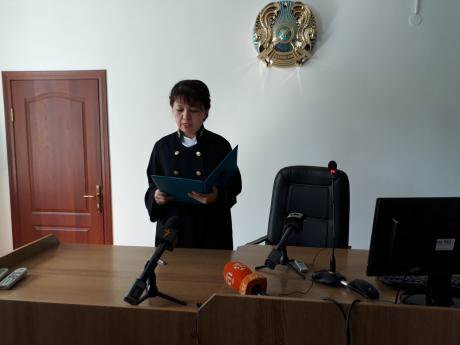 “She was forced to violate the law by illegally crossing the border of the Republic of Kazakhstan.” Because Sauytbay had been kept in custody since 23 May, the prosecutor asked the judge to award a six-month suspended sentence. The prosecutor’s request was greeted by cheers and jubilation by the attendees, particularly Sauytbay’s relatives and supporters who crammed the courtroom and the square outside the courthouse. After a short media appearance, Sauytbay was advised by her lawyer Abzal Kuspan to refrain from interviews in an effort not to antagonise the Kazakh authorities, who are now in charge of processing her request for refugee status. Kuspan explained that the judge took into account Sauytbay’s status as a person seeking asylum in her ruling, but until his client is granted such status she cannot claim the right to remain in the country. 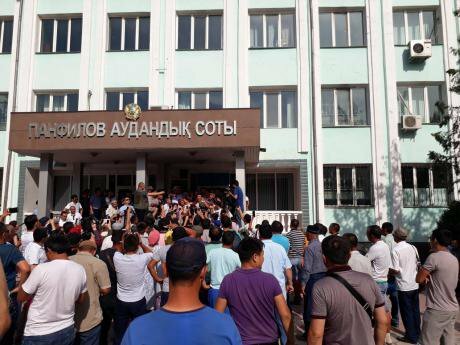 According to Kazakh law, the commission on granting refugee status has to consider Sauytbay’s application within three months and the final decision has to be taken within one year. “We cannot really afford to go against the interests of our state because Kazakhstan and China maintain friendly relations and for Sayragul this is fraught with certain consequences,” Kuspan suggested. While Sauytbay claimed that there were about 2,500 ethnic Kazakhs in the camp where she worked, according to anecdotal evidence and information released by the Kazakh Foreign Ministry, among the internees there are also ethnic Kazakhs born in China who have managed to become Kazakh citizens through the repatriation programme. In May, Kazakh Foreign Minister Kayrat Abdrakhmanov said that nine of 12 Kazakh citizens detained in China for holding dual citizenship had already been released, but he also revealed that Kazakh diplomats had been working on lifting Chinese restrictions imposed on 625 ethnic Kazakhs to leave for Kazakhstan. The minister failed to specify whether these individuals had been detained for holding Kazakh citizenship. Sauytbay’s trial and a wealth of first-hand accounts by Kazakh citizens and ethnic Kazakhs from China have forced the Chinese authorities to recognise the problem and work with Kazakhstan on its resolution. Publicity around the trial, in particular, and around the problem, in general, are damaging bilateral relations between Kazakhstan and China which had been developing “quite well”, according to Rasul Zhumaly, an Almaty-based political analyst. Coming to terms with this problem, Chinese diplomatic missions in Astana and Almaty have organised a trip to China, including Xinjiang, for a delegation of 18 Kazakh public figures between 13 and 19 August. “There are already small flickers of hope. People are already being released and (the Chinese authorities) are already agreeing to some discussion, whereas one year ago they said this was strictly China’s internal affair,” Zhumaly, who was part of the delegation, told openDemocracy. “Now the rhetoric is changing: apart from those who will be released now, many people in Xinjiang are indeed intimidated and we sensed this atmosphere of fear” during the trip, he said. While ethnic Kazakhs in China may have a glimmer of hope to improve their lives, at least by seizing a chance to move to Kazakhstan - according to Zhumaly’s estimates, half of China’s 1.5 million ethnic Kazakhs are seriously considering the move - the fate of Uighurs in Xinjiang seems less promising because they lack official institutions that could act on their behalf. On 13 August, the American Anthropological Association asked Terry Branstad, the US ambassador in Beijing, “to do what you can to locate and offer protection to Dr (Rahile) Dawut”, a celebrated anthropologist and renowned scholar from China’s Uighur ethnic minority group, who went missing in China in December 2017. “Her family and friends believe she was secretly detained as part of the Chinese government’s severe crackdown on Uighurs,” Edward Liebow, the association’s executive director, wrote to the ambassador. “While Uighurs’ unique culture has been under scrutiny by China recently, Dr Dawut, who wrote and lectured widely on Uighur folklore and traditions, is far from being a threat of any kind. In fact, until recently, her work had been supported with grants and awards from China’s Ministry of Culture,” the letter signed by Liebow said.